We had quite the month in September. WE celebrated 10 years in business! Yay us! I am so thankful to be a survivor of being a business owner. 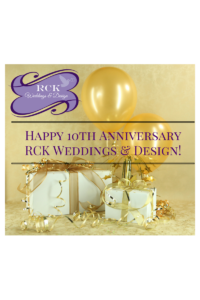 We’ve grown so much at RCK Weddings & Design and enjoy the continuing of learning at every opportunity. While learning from everything is important at RCK, being involved in reputable organizations is also important. I’m a member of quite a few great organizations like VAWE (Virginia Wedding Network), SWP (Shenandoah Wedding Professionals), and Top of Virginia Regional Chamber. I’m grateful for the opportunities I’ve been given by belonging to these awesome networking organizations. WE have some new things happening with RCK too! I’m in the process of getting an new office space to meet with all of you (my clients). This office space will have room for a design consultation and do mock set ups. I can’t wait to reveal that to you all very soon!! It’s so exciting! I have a few meetings with a few different locations. Hopefully I’ll know soon which will be the new home of RCK Weddings & Design. We love our couples that we get to plan or coordinate for. We had the pleasure of coordinating a beautiful wedding for L & J, I was asked not to put their full names. The lovely wedding was held at the beautiful and tranquil Tranquility Farms. Tranquility Farms is very tranquil just like their name describes. You’ll have to check it out in person to see the full beauty. Here’s a sneek peak of a couple photos I was able to capture.